Now we are in the summer month, and it is time to focus on having some good riding experiences on your motorcycle. Also it is time to share the happy message, that riding the motorcycle is pretty fun, cool and a good means of transport. "Ride to Work" on Monday 18. Juni 2012, is a worldwide initiative where motorcyclists ride their motorcycle to work, and hereby makes it visable that riding the motorcycle on a daily basis is possible and a good idea. 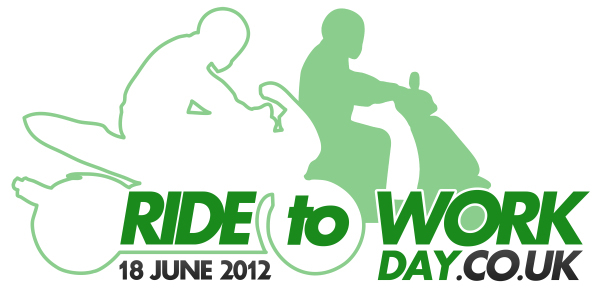 The UK branch of Ride to Work can be found on this link - www.ridetoworkday.co.uk. It is a great initiative they have taken to show commuters how enjoyable the daily ride can be. You can visit the international organization on this link www.ridetowork.org. To promote the good course, RIde to Work in the UK branch made a pretty fun video with a clear signal, that you need to protect yourself - see the YouTube Video. On Tourstart we have prepared the web site so you can ride share your "RIde to Work" tour. Watch the YouTube vide by click on this link and see how to get started to create a great tour and how to share it on your facebook wall. I am sure it will be of great inspiration for all to see how exciting you can do your daily commute to and from work. Anyway, Ride to Work in a new route is an easy way to break the daily routine, so you better get started to plan a great motorcycle tour and get some positive energy. Locally in many countries are also a lot of initiatives enhancing the good motorcycle ride. It Denmark all motorcycle dealers decided to promote the motorcycle this week, by focusing on any aspects about motorcycle riding. The web site is www.motorcykelugen.dk and it gives you a unique chance to test Google Translate, as the web site is in Danish only - sorry for that. Anyway, have a look and be inspired to start some local, national or internationalmotorcycle initiatived with the aim to spread the positive information about motorcycle tours and motorcycle activities.